You will be met on arrival at the airport and transfer to the hotel. day for rest and acclimatization. After breakfast depart for Alchi. 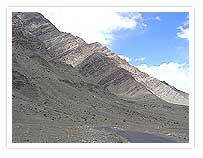 In route visit Rizong Gompa, situated in a truly beautiful mountain setting. Rizong is a relatively new monastery, founded in 1829 by Tshul-khrims Nyi-ma and presently has about 30 lamas attached to it. It also has the reputation of being the best disciplined monastery in Ladakh. Return to the campsite for lunch. Continue on to Alchi Gompa, located near the small village of Saspol. It is one of the earliest monasteries built in Ladakh, dating from the 11th century. Alchi gompa also contain numerous wall murals, often of Rin-chen bZang-po, meant to honour his activities as a translator in collaboration with Indian teachers of Buddhism. Dinner and overnight in camp. After breakfast drive to Lamayuru Gompa, with its medieval village seemingly growing out of the rocky hillside below it. In the past, Lamayuru has housed up to 400 lamas, but presently there are only 30 to 50 lamas living here, although about 150 lamas belong to the gompa. After breakfast begin the drive into the Zanskar Valley. Stop for a picnic lunch and take a walk up to the Gunri glacier. Continue on to Rangdum, where camp is set for the night. Dinner and overnight in camp. After breakfast explore Rangdum gompa. It is perched on a steep sugarloaf mountain housing some 40 monks of the Gelug-pa (yellow cap) sect. According to an inscription, the gompa was built around 260 years ago by Gelek Yashy Takpa during the reign of King Tsewang Namgyal of Ladakh. The small mani walls here and towards Padum are more ornate than in Ladakh. Buddha reliefs are arranged on the stones and some of the stones are carved not only with the usual om mani padme hum mantra but also with pictures of chortens and mandalas. Dinner and overnight in camp. Drive over the Pensi la (4,401 m). Walk to Tashi Tsering gompa. After a picnic lunch, drive to Tongri where camp is set for the night. After breakfast, spend the day exploring Karsha, the most important gompa in Zanskar. Return to the campsite at Tongri for dinner and overnight stay. After breakfast drive along the Zanskar river to Zangla. 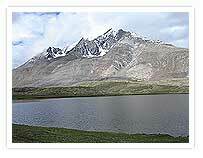 where the king of Zanskar has his castle. Explore the castle and its surroundings before returning to Tongri for dinner and overnight in camp. 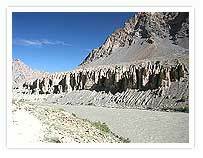 Today you drive to Padum, the capital of Zanskar, situated on the southern part of a wise fertile plain where two rivers join to form the Zanskar. Walk to Stongde and explore the gompa situated high above the riverbank. Return to the campsite at Tongri for dinner and overnight stay. After breakfast depart for the return drive to Rangdum. Dinner and overnight in camp. After an early breakfast depart on the return drive to Leh.